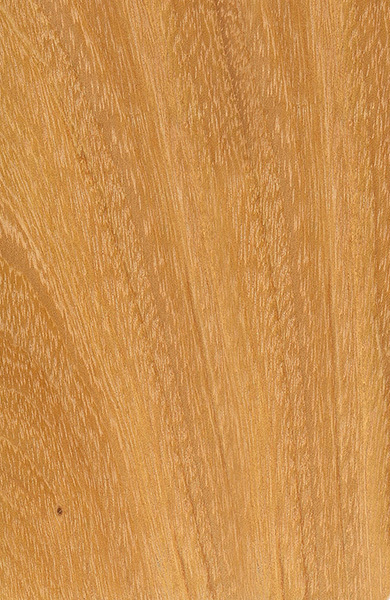 Color/Appearance: Heartwood is golden to bright yellow, which almost certainly ages to a darker medium brown with time: primarily due to exposure to UV light. 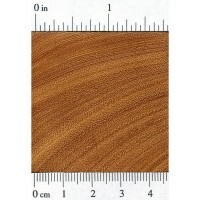 See the article Preventing Color Changes in Exotic Woods for more details. 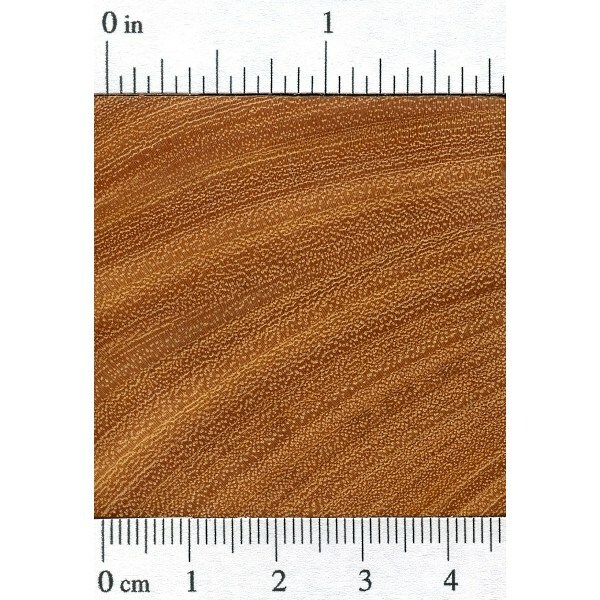 A Guatemalan variant exists which is sometimes called “Guatemalan Tigerwood” or “Mora” (not to be confused with Mora excelsa, which also goes by the common name of Mora) which is light to medium reddish brown, with streaks of lighter and darker material. 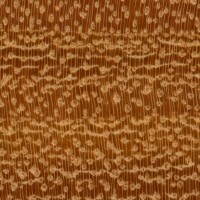 Grain/Texture: Has a straight to interlocked grain, with a fine to medium texture. 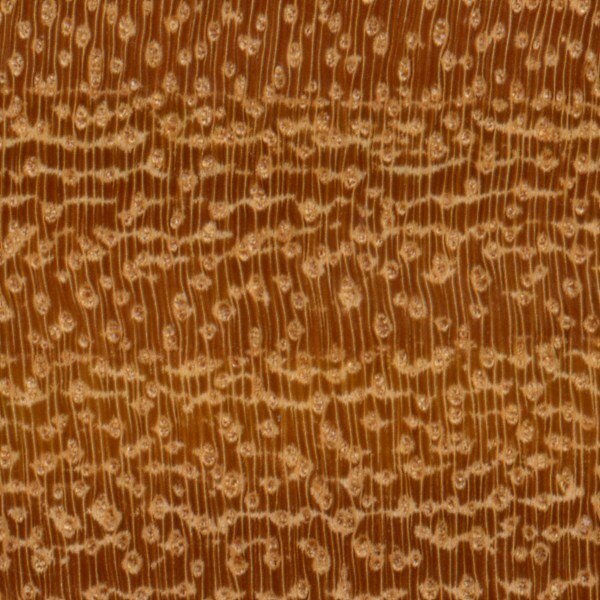 Endgrain: Diffuse-porous; large to very large pores in no specific arrangement; commonly in radial multiples of 2-3; tyloses and other deposits common; growth rings may be distinct due to seemingly marginal parenchyma; narrow to medium rays visible without lens, spacing normal to fairly close; parenchyma banded, paratracheal parenchyma vasicentric, lozenge, winged, and confluent. Rot Resistance: Argentine Osage Orange is very durable and has good weathering characteristics; it is also resistant to termites. Workability: Working this wood can be difficult due to its hardness and density, though it is reported to have little dulling effect on cutting edges. It turns well, and also takes stains, glues and finishes well. Allergies/Toxicity: Sap has been reported to cause dermatitis. See the articles Wood Allergies and Toxicity and Wood Dust Safety for more information. Pricing/Availability: Argentine Osage Orange should be moderately priced for an imported hardwood. Prices are likely to be comparable to the domestic species of Osage Orange. Common Uses: Heavy construction (within the tree’s natural range), flooring, furniture, turnings, and other small specialty wood items. Perhaps one of the most confusing names in modern hardwood commerce is the selling of a Guatemalan variety of Osage Orange—which looks vastly different than the traditional yellow color—that’s being marketed as “Mora.” Unfortunately, the common name Mora has traditionally been used for an unrelated wood found in northern South America (not found in Guatemala) known by the scientific name Mora excelsa. Argentine Osage Orange is sometimes called Fustic because the wood contains a yellow dye called fustic—which has historically been used in making brown, yellow, and green colored dyes for fabric. I have made several bamboo backed longbows from this wood and they shoot quite well. Hi Mariano. The common name in Argentina is “mora amarilla”. Trees grow at Misiones, Salta and Tucumán provinces. Common name of the tree? I’m in Argentina, and don’t know trees by latin name.